The Director General of Al-Mukalla District Mr. Awad Ahmed Bin Hamel received in his office the Head of Field Office of Hadramout Governorate for the Society for Humanitarian Solidarity (SHS) Mr. Taleb Al Dadaoua. 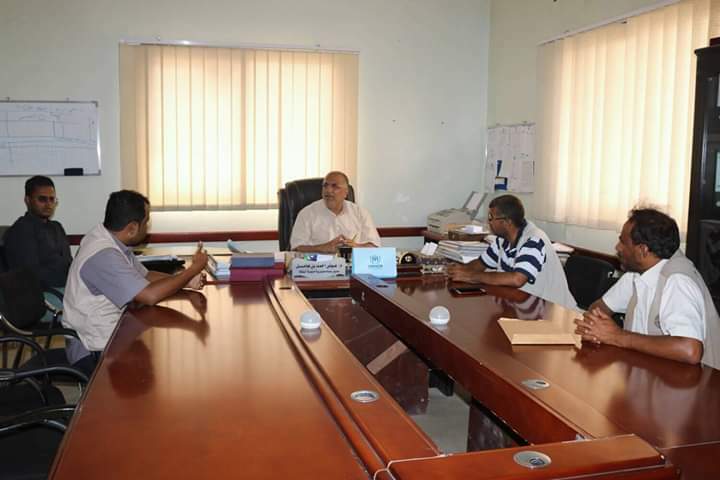 The meeting was intended to discuss and strengthen the good cooperation and coordination between the local authorities of Al-Mukalla District and the Society for Humanitarian Solidarity (SHS). Particularly the meeting highlighted the activities that will be implemented by SHS in Al-Mukalla district during the coming months. During the meeting Mr. Taleb Al-Dadaoua of SHS described the objectives and expected outcomes of the SHS activities, which are part of overall efforts in to providing humanitarian assistance to the poorest families in the area. During the meeting, the Director General emphasized the importance of the cooperation and coordination in all activities related to the work of the SHS in achieving the desired impact through successful implementation of SHS humanitarian work.